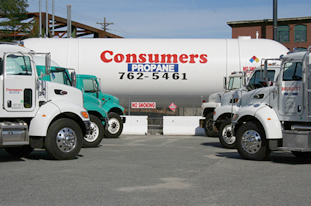 Consumers has been a family owned and operated full service business since 1919. We provide affordable, dependable oil and fuel delivery, heating system installations and service to homes and businesses throughout Northern Rhode Island and Southeastern Massachusetts. We offer only high quality products and expert service to meet the needs of our customers, at a fair and competitive price. We are fully licensed and insured. Our employees are properly trained and qualified to insure total customer satisfaction. At Consumers Propane & Bousquet Oil, we always focus on customer service. You will never be just a number to us! We pride ourselves on knowing our customers on a first name basis. More importantly, we will get to know what your heating needs are and render the personal service you expect. For emergency heating services please call our office. Our office hours are Monday – Friday 7:30 AM to 4:30 PM.